Before I get into the review, I wanted to mention that you should keep a look out on the blog later in July for my blog tour stop where I will be interviewing B.T. Gottfred and also have an awesome giveaway of Forever for a Year! When Carolina and Trevor meet on their first day of school, something draws them to each other. They gradually share first kisses, first touches, first sexual experiences. When they’re together, nothing else matters. But one of them will make a choice, and the other a mistake, that will break what they thought was unbreakable. Both will wish that they could fall in love again for the first time . . . but first love, by definition, can’t happen twice. Told in Carolina and Trevor’s alternating voices, this is an up-close-and-personal story of two teenagers falling in love for the first time, and discovering it might not last forever. Special thanks to Henry Holt and Co. (BYR) for providing me with a copy of the book for review! 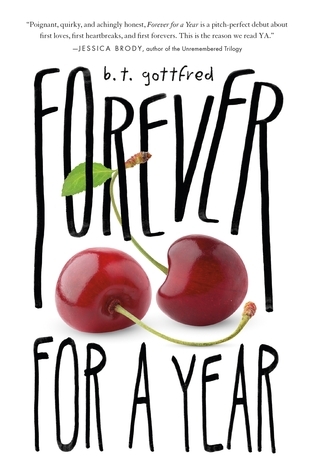 Forever for a Year is a book that tells it like it is: the good, the bad, and the ugly included. When I first started reading this book is was unsure if I was going to like it. There’s a very distinct writing style for both Carolina and Trevor’s chapters. Both include their every detail and thought, as if they were talking to you as a friend, or to themselves in their own head. While the naïevety of the characters was something I had to overlook, the relationship between Carolina and Trevor was hard to, as it was the main storyline. That being said, after their relationship got past the insta-love, awkwardness, and silliness, I didn’t mind it that much. Their relationship was realistic of one happening in high school, and I really liked how Gottfred didn’t shy away from the serious topics. While I was happy that Gottfred tells it like it is, there were some points where he included a little too much information for my liking. It made me kind of uncomfortable and grossed me out, which I wasn’t really expecting from this book. At a whopping 432 pages, Forever for a Year was an extremely quick read for me. While the relationship between Carolina and Trevor wasn’t my favorite, I really loved the incorporation of the realistic and equally as difficult family dramas, friendship troubles, and high school problems such as popularity. No matter how cliché it may seem to you while reading, you know those are things that cross everyone’s mind at some point. Overall, Forever for a Year is a difficult book for me to rate. There were certain parts that I just couldn’t fall in love with, while there were other parts that I respected for their realism. I wouldn’t recommend this for younger YA readers, but those with the maturity to handle more serious topics would certainly enjoy Forever for a Year by the pool or at the beach! I’ll have some political intrigue with a side of sexual tension, please! I skimmed this book, and it was REALLY awkward in my opinion. Like the things they said and did were just unrealistic and WEIRD. Like what?! the writing was good though… Nice review! I like the idea of a unique style. i read a bit and i did like that because when you start freaking out, this author really told i like it is. but then i read some of the other stuff and it was absolutely disgusting. like i know it’s real and stuff but i didn’t want to read romance scenes that would make me cringe and scream “gross” so i think i’ll pass on this one. Gosh yes…Agree with everything you said. Yeah I was on the fence about how this one made me feel. But I definitely give the author props for taking a risk with the contents.